How to Be a Sister begins when Eileen, after several years in New Mexico, has just moved back to the Pacific Northwest, where she grew up. Being 1,600 miles away had allowed Eileen to avoid the question that has dogged her since birth: What is she going to do about Margaret? Now, Eileen must grapple with this question once again as she tentatively tries to reconnect with Margaret. How can she have a relationship with someone who can’t drive, send email, or telephone? What role will Eileen play in Margaret’s life as their parents age, and after they die? Will she remain in Margaret's life, or walk away? 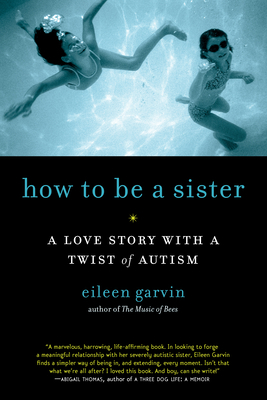 A deeply felt, impeccably written memoir, How to Be a Sister will speak to siblings, parents, friends, and teachers of people with autism—and to anyone who sometimes struggles to connect with someone difficult or different. Eileen Garvin was born and raised in the Pacific Northwest. The youngest of five children, she has always been close to her sister Margaret. She completed her B.A. in English at Seattle University, and her M.A. in English at the University of New Mexico. She writes for newspapers, magazines, and Web sites from Hood River, Oregon, where she lives with her husband.